We spent the first couple hours yesterday in transit. Our home, Jaw, is located near the capital city of the province just south of Phnom Penh. One thing an American will notice about Cambodian culture is that the pace of everything is much slower. People don't hurry on the roads. They don't plan out every hour on their calendar. When we asked Sam how long our drive down would take he said, "Two hours, give or take five." Outside of the major city, lunch consisted mostly of authentic Cambodian food. The servers would place some stew or a fish on the center of the table and let us dish up whatever we wanted. They went around making sure we had plenty of rice. A meal without rice is almost unheard of in this country. We checked into our new guesthouse around noon. It's a six story tall hotel with running water, Wi-Fi, and air conditioning. It was only built 6 months ago. This nation is rapidly modernizing, especially in the areas around the capital city. At 1:30 p.m. we arrived at Jaw. The children there introduced themselves to us by singing a song and telling us their names and ages assisted by a translator. After that, we sang a song of our own and gave them our own names and ages. The kids at Jaw are more shy than the ones we met the day before at the training center. They aren't used to seeing new people from a different nation. At 2:15 we got to work. The first major project at this home is to build a fence. This gives the property protection, privacy, and legitimacy. 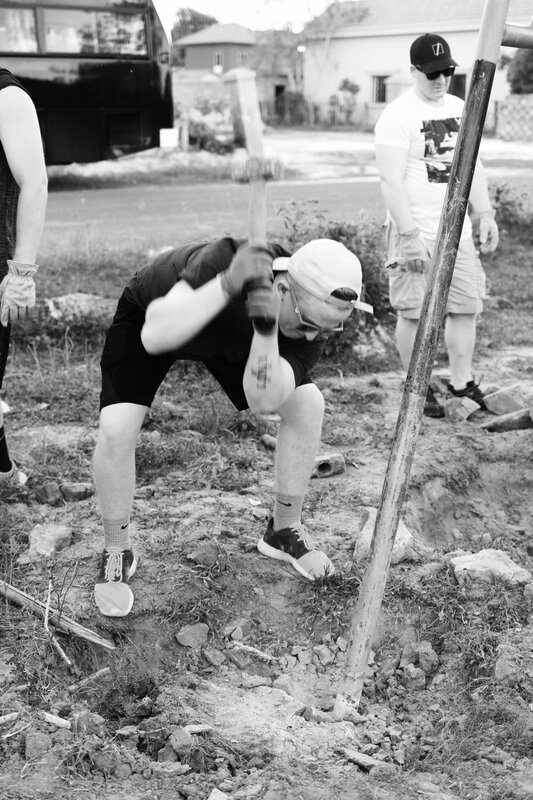 We followed the lead of the FCOP staff who immediately began fastening rebar poles together and digging holes for fence posts. We made some excellent headway in the time that we had, especially as we had to move an entire swingset further into the property. By the end of the day, the children had begun to warm up to us, especially those of us working near them. Over the next few days, we both have a lot to give one another.